A group of United Way partner agencies worked together to give Anna Cater the confidence to realize her potential and land her dream job. 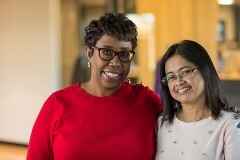 WMCAT instructor Andrea Owens, right, pictured with former student Anna Cater. Today, Anna Cater is a hospital billing professional at Spectrum Health. Getting there required her to overcome linguistic and cultural barriers – and, even more importantly, to develop confidence in herself. Cater grew up in the Philippines. Even though her parents were farmworkers, they could barely afford food. “I said to myself, I’m not going to live like this,” she recalls. Thanks to a scholarship and a lot of determination, Cater earned a math degree and a teaching certificate. But in a country with a high unemployment rate, she couldn’t find work. So in 2002, she moved to the U.S. Over the next decade, she got married and raised a family in Grand Rapids, but her dream of pursuing a career stalled, in part because she didn’t have confidence in her English. That’s when she found the Literacy Center of West Michigan. In 2015 the Literacy Center tested her and, to her surprise, placed her in an advanced ESL class that mixed online and in-person sessions. Her classmates came from all over the world: China, Mexico, Europe, and Africa. “She studied hard and did a lot of extra work researching various career fields. She was very self-motivated,” says Jennifer Summers, program coordinator at the Literacy Center. After Cater completed the course, earning a National Career Readiness Certificate, Literacy Center staff referred her to the Women’s Resource Center, where she enrolled in computer classes, attended group meetings and met with a career coach. Her coach helped her realize she was a good fit for a career as a pharmacy technician or medical billing professional. As it happened, those were exactly the programs offered at the West Michigan Center for Arts & Technology. Cater enrolled in WMCAT’s medical billing program in 2017. The course began that September, but she wanted to make the most of the opportunity, so she met with her instructor, Andrea Owens, in the summer and asked her for a list of books to read so she could prepare. “She’s a hard worker,” Owens says. In her classroom, Owens teaches the technical skills students need to become medical billing professionals, but a good portion of her curriculum is devoted to Leadership By Design. Developed by WMCAT, Leadership By Design focuses on “soft skills”: emotional intelligence, workplace etiquette, interpersonal dynamics. One of the employers Cater interacted with most at WMCAT was Spectrum Health. “They were there all the time,” she says, recalling how an executive from the organization participated in mock interviews with her class. In February 2018, Cater started an “externship” at Spectrum. Before three months had passed, they offered her a job. This past August, Cater was invited to speak at a Spectrum Health fundraising event for United Way. The woman who had once been too self-conscious to leave her house for fear she might have to talk to someone now found herself standing on a stage in front of hundreds of people, telling her story. Heart of West Michigan United Way funds the Literacy Center of West Michigan, Women’s Resource Center and WMCAT as part of its Financial Security focus area. In the 2017-2018 funding year, United Way invested $1.3 million in Financial Security programs, helping a total of 5,872 people in Kent County.